نجف خانی, علی, میر عبد اله لواسانی, آرش, زکی زاده, مهدی. (1397). مطالعه تجربی اثر تغییرات سطح برای کاهش درگ در یک مبدل حرارتی با چیدمان مثلثی. نشریه پژوهشی مهندسی مکانیک ایران, 20(4), 132-148. علی نجف خانی; آرش میر عبد اله لواسانی; مهدی زکی زاده. "مطالعه تجربی اثر تغییرات سطح برای کاهش درگ در یک مبدل حرارتی با چیدمان مثلثی". نشریه پژوهشی مهندسی مکانیک ایران, 20, 4, 1397, 132-148. نجف خانی, علی, میر عبد اله لواسانی, آرش, زکی زاده, مهدی. (1397). 'مطالعه تجربی اثر تغییرات سطح برای کاهش درگ در یک مبدل حرارتی با چیدمان مثلثی', نشریه پژوهشی مهندسی مکانیک ایران, 20(4), pp. 132-148. نجف خانی, علی, میر عبد اله لواسانی, آرش, زکی زاده, مهدی. مطالعه تجربی اثر تغییرات سطح برای کاهش درگ در یک مبدل حرارتی با چیدمان مثلثی. نشریه پژوهشی مهندسی مکانیک ایران, 1397; 20(4): 132-148. Walsh, M. J., “Riblets as Viscous Drag Reduction Technique”, The American Institute of Aeronautics and Astronautics Journal, Vol. 21, pp. 485-486, (1983). Bechert, D. W., Bruse, M., Hage, W., Vanderhoeven, J., and Hoppe, G., “Experiments on Drag-reducing Surfaces and their Optimization with an Adjustable Geometry”, Journal of Fluid Mechanics, Vol. 338, pp. 59–87, (1997). Han, X., Zhang, D. Y., Li, X., and Li, Y. Y., “Bio-replicated Forming of the Biomimetic Drag-reducing Surfaces in Large Area Based on Shark Skin”,Chinese Science Bulletin, Vol. 53, pp. 1587–1592, (2008). Zhang, D. Y., Luo, Y. H., Li, X., and Chen, H. W., “Numerical Simulation and Experimental Study of Drag-reducing Surface of a Real Shark Skin”, Journal of Hydrodynamics, Vol. 23, pp. 204–211, (2011). Zhang, D. Y., Li, Y. Y., Han, X., and Li, X., “High-precision Bio-replication of Synthetic Drag Reduction Shark Skin”, Chinese Science Bulletin, Vol. 56, pp. 938-944, (2011). Zhang, D. Y., Luo, Y. H., Chen, H. W., and Jiang, X. G., “Exploring Drag-reducing Grooved Internal Coating for Gas Pipelines”, Pipeline Gas Journal, Vol. 238, pp. 58–61, (2011). Leonardo, P. Ch., Arndt, R. E. A., and Sotiropoulos, F., “Drag Reduction of Large Wind Turbine Blades through Riblets: Evaluation of Riblet Geometry and Application Strategies”, Renewable Energy, Vol. 50, pp. 1095-1105, (2013). Martin, S., and Bhushan, B., “Modeling and Optimization of Shark-inspired Riblet Geometries for Low Drag Applications”, Journal of Colloid and Interface Science, Vol. 474, pp. 206–215, (2016). Luo, Y. H., and Zhang, D. Y., “Investigation on Fabricating Continuous Vivid Sharkskin Surface by Bio-replicated Rolling Method”, Applied Surface Science, Vol. 282, pp. 370-375, (2013). Pan, J. F., Chen, H. W., Zhang, D. Y., Zhang, X., Yuan, L. M., and Li, A. B., “Large-scale Solvent-swelling-based Ampliﬁcation of Micro Structured Sharkskin”, Journal of Micromechanics and Microengineering, Vol. 23, No. 07, (2013). Wen, L., Weaver, J. C., and Lauder, G. V., “Biomimetic Shark Skin: Design, Fabrication and Hydrodynamic Function”,Journal of Experimental Biology, Vol. 217, pp. 1656-1666, (2014). Luo, Y. H., Liu, Y. F., and Zhang, D. Y., “Inﬂuence of Morphology for Drag Reduction Effect of Sharkskin Surface”, Journal of Mechanics in Medicine and Biology, Vol. 14, No. 02, (2014). Chen, H. W., Rao, F. G., Shang, X. P., Zhang, D. Y., and Hagiwara, I., “Flow over Bio-inspired 3D Herringbone Wall Riblets”, Experiments in Fluids, Vol. 55, No. 03, (2014). Luo, Y., Yuan, L., Li, J., and Wang, J., “Boundary Layer Drag Reduction Research Hypotheses Derived from Bio-inspired Surface and Recent Advanced Applications”, Micron Journal, Vol. 79, pp. 59-73, (2015). Fu, Y.F., Yuan, C.Q., and Bai, X.Q., “Marine Drag Reduction of Shark Skin Inspired Riblet Surfaces”, Biosurface and Biotribology, Vol. 3, pp. 11-24, (2017). Lam, K., and Cheung, W. C., “Phenomena of Vortex Shedding and Flow Interference of Three Cylinders in Different Equilateral Arrangements”, J. Fluid Mechanics, Vol. 196, pp. 1–26, (1988). Tatsuno, M., Amamoto, H., and Ishi, I. K., “Effects of Interference Among Three Equidistantly Arranged Cylinders in a Uniform Flow”, Fluid Dynamics Research, Vol. 22, pp. 297–315, (1998). Zhifu, G., and Tianfeng, S., “Classifications of Flow Pattern on Three Circular Cylinders in Equilateral-triangular Arrangements”, Journal of Wind Engineering and Industrial Aerodynamics, Vol. 89, pp. 553–568, (2001). Pouryoussefi, S. G., Mirzaei, M., and Pouryoussefi, S. M.,“Force Coefficients and Strouhal Numbers of Three Circular Cylinders Subjected to a Cross-flow”, Archive of Applied Mechanics, Vol. 81, pp. 1725–1741, (2011). 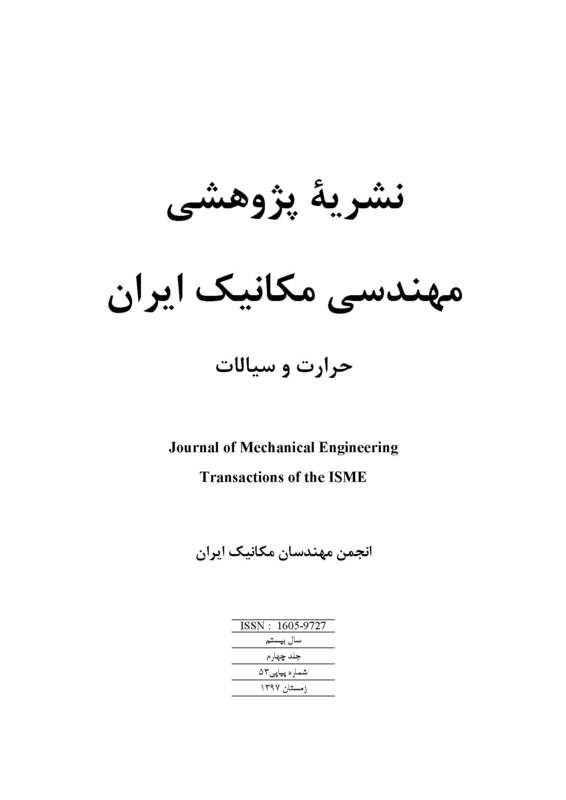 M.A.Lavasani, A., Bayat, H., and Maarefdoost, T.,“Experimental Study of Convective Heat Transfer from In-line Cam Shaped Tube Bank in Crossflow”, Applied Thermal Engineering, Vol. 50, pp. 2605–2611, (2014). Zhou, B., Wang, X., and Guo, W., “Experimental Measurements of the Drag Force and the Near-wake Flow Patterns of a Longitudinally Grooved Cylinder”, Journal of Wind Engineering and Industrial Aerodynamics, Vol. 145, pp. 30–41, (2015).